Fabric shelters appeal to both individuals and businesses mainly because of their versatility. They can be used to store virtually anything from office supplies and lawn gear to unused household items, garden equipment and furniture. 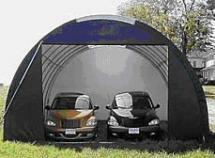 Then again, there are homeowners who use portable shelters as car garages. If you would like to work from home but are unable to because of limited space to setup an office, you can use portable shelters to erect a home office in your backyard. Still, fabric structures can be utilized as areas where people can unwind, while savoring their drinks and foods in the summer. Portable shelters are built for different types of materials. As such, depending on what you are looking for, you can make your selection from high-quality to standard materials. Irrespective of your selection, it is important to point out that fabric structures are affordable and durable. A recent study showed that a standard fabric shelter can last for up to 10 years. But, the key to ensuring that your portable shelter lasts for at least 15 years is proper maintenance. While it is true that portable shelters come with warranty, you need to carry out routine maintenance in order to ensure its durability. Consequently, you will have to clean and check the fabric for tears from time to time. The materials used in making temporary fabric shelters are made from weatherproof materials, which mean that they can withstand virtually all types of weather elements. But this does not necessarily mean that the materials cannot be damaged by dampness. During winter, snow tends to accumulate on the roof. If left to thaw, snow can cause dampness. Besides dampness, you also need to check for tears on the seams. If not addressed on time, torn seams can cause further damage to your fabric shelter. The frames should also be assessed on a regular basis for warping and twists. Warping and bending is usually caused as a result of placing heavy and bulky objects against the frames. Warped frames should be replaced immediately since they can cause the fabric shelter to weaken. Lastly, before building a portable shelter, it is important that you place a ground cover. In addition to making it simpler to clean the portable shelter, ground cover prevents ground water from damaging the items stored therein. Ventilation is also an important aspect in fabric structure maintenance as it deters accumulation of moisture inside the structure.